The smart home market is estimated to grow from USD 25.38 Billion in 2015 to USD 56.18 Billion by 2020, at a CAGR of 17.2% between 2015 and 2020, while the assisted living market is estimated to grow from USD 1.20 Billion in 2015 to USD 3.96 Billion by 2020. This report provides a detailed analysis of the smart home and ambient assisted living market based on different segments such as products, services, and regions. The report forecasts the market size, in terms of value, of various segments with regard to four main regions: Americas, Europe, Asia-Pacific (APAC), and Rest of the World (RoW). It strategically profiles the key players and comprehensively analyzes their market rankings and core competencies, along with the detailed competitive landscape for the market leaders. The smart home market is expected to grow from USD 25.38 Billion in 2015 to USD 56.18 Billion by 2020, at a CAGR of 17.2% between 2015 and 2020. 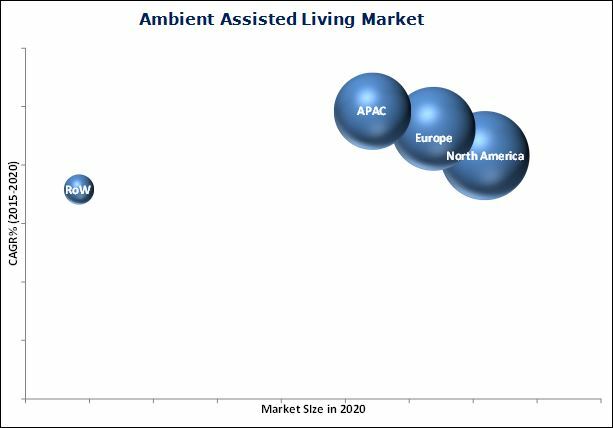 The market for ambient assisted living is estimated to grow from USD 1.20 Billion in 2015 to USD 3.96 Billion by 2020. Ambient Assisted Living (AAL) is a developing multi-disciplinary field that aims at using information and communication technologies in personal healthcare and telehealth systems for catering to the needs of the aging population. The aging population is more vulnerable to illnesses and physical disabilities compared to adults. Moreover, heart disease, stroke, diabetes, obesity, and arthritis are also commonly observed among elderly people. Therefore, they need to be continuously monitored or assisted, which creates the demand for assistive products such as telemonitoring/telemedicines, communication devices, or products which can compensate for sensory impairments such as visual or hearing. Furthermore, due to the rise in increased activities of the ambient assisted living joint programme (AAL JP), the AAL market finds a huge opportunity to proliferate in the next five years. The European government is taking initiatives to enhance the quality of life of elderly people and strengthen the industrial base in Europe through the use of information and communication technologies (ICT) and supporting various AAL activities. The scope of this report covers the smart home and ambient assisted living market by product, service, and region. Security & access control is expected to hold the largest share and lead the smart home market from 2015 to 2020, due to increasing safety and security concerns. The security and access control prevents unauthorized entry, theft, and burglary in homes. These solutions can also call emergency services in case of any such incident. Advancements in the wireless technology and the internet enable remote monitoring of property. The integration of smart devices with smartphones facilitates the handling of all features of the security and access control solution. Medical assistive product and telemonitoring/ telemedicine are expected to play a key role in ambient assisted living landscape and would grow at the highest rate during the forecast period as there is a rise in chronic diseases. The increasing aging population, urbanization in the APAC region, increasing per capita healthcare expenditures in the U.S., Mexico, Germany, the U.K., France, Italy, China, India, and the UAE, advancements in the healthcare segment and information communication technology spur the growth in this market. Installation and repair services are expected to lead the smart home market and hold the largest share, whereas customization & renovation services would grow at the highest rate during the forecast period. An increased demand for energy managements systems, security & access control products, HVAC controls, and entertainment controls is fueling the growth of smart homes which would lead to the growth of the services market. North America is expected to hold the largest share and lead the smart home and ambient assisted living market between 2015 and 2020. The demand for energy management coupled with the increasing demand for green homes has resulted in the growth of the North American smart home market. This region is expected to grow at a high rate owing to the concentration of major players such as Emerson Electric Co. (U.S.), Crestron Electronics Inc. (U.S.), and United Technologies Corporation (U.S.), among others. The other factors contributing to the growth of the smart homes market in North America are the inclination toward upscale lifestyle, requirement of security, and government regulations to save power. Europe and APAC are expected to witness significant growth rate for the AAL market. However, a huge requirement of capital investment and significant maintenance costs restrain the growth of the smart home market and the inability of AAL devices to reach aged people living in small towns or villages restrain growth of the AAL market. Major vendors in the market include Honeywell International, Inc. (U.S.), Siemens AG (Germany), Schneider Electric S.E. (France), Ingersoll Rand Plc. (Ireland), Legrand SA (France), ABB Group (Switzerland), Medic4all group (Switzerland), Tunstall Healthcare Ltd (U.K.), Chubb Community Care (U.K.), Televic N.V. (Belgium), Telbios (Italy), Vitaphone GmbH (Germany), GETEMED AG (Germany), Koninklijke Philips N.V. (Netherlands), CareTech AB (Sweden), and Assisted Living Technologies, Inc. (U.S.). These players adopted various strategies such as new product developments, mergers, partnerships, collaborations and business expansions to cater to the needs of the smart home and ambient assisted living market. For instance Legrand entered into joint venture agreement with Neat (Spain) to expand its business in assisted living market. Neat is one of the leading players in assisted living market in Spain and is a major player in the European market. In addition, Tunstall Healthcare Group and Apria Healthcare (U.S.) entered into an agreement to make Tunstall Personal Emergency Response Systems available to help and improve patient outcomes and quality of life. 12.12 Assisted Living Technologies, Inc. Figure 72 Medical Assistive Product Segment Expected to Grow at A High Rate in the AAL Market in the U.K.